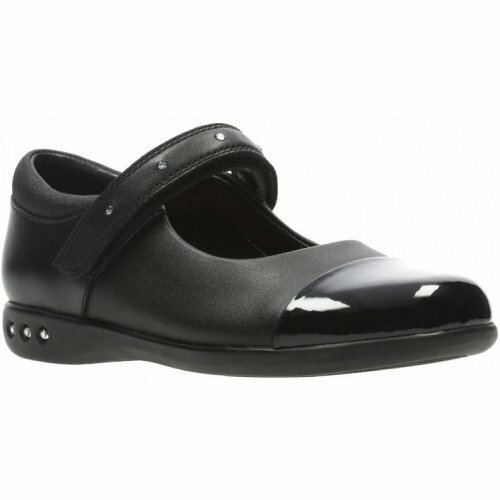 Clarks Prime Walk is a girls Mary Jane styled school shoe. It features a soft leather upper with synthetic linings. The single Velcro fastener allows for adjustability but still maintains a secure fit when walking, making this shoe a perfect for long school days. Agion linings help to keep feet fresh all day long, whilst the Ortholite footbed provide long lasting cushioning and breathability. A touch of sparkle is added to the shoe with diamante detailing on the Velcro strap and the heel, adding extra style to the shoes. Jump into fun with Clarks Prime Walk!